Don't you just love this cute little tin of cards? Grab 3 friends and book a date. Invite me along to bring all the supplies and you can all take one of each card home with you. Between four friends this kit will each cost you just over $16. For 4 cards that's way cheaper than anything you'll buy in the store and way nicer too. You'll have to draw straws to see who gets the tin though! I don't blame you - option two is to buy the kit yourself and put it together. You get to keep the tin and you make 16 fabulous cards. If you purchase the stamp set, the inks and some adhesives you're well on your way to earning Stampin' Rewards to spend on more fabulous product. Grab some friends and get them stamping. Two friends each with a kit and the supplies between you will see you reach the minimum for Stampin' Rewards. You'd get a minimum of $30 to spend on anything you like from the Stampin' Up! catalogue. 7 friends/7 kits = $129.74 in free Stampin' Up! product for you. Therefore you can spend just $59.26 (after the purchase of your kit and share of supplies) and earn up to $499 worth of product by stamping with your friends and joining my team this month. What have you got to loose? Show your friends the video of this awesome kit and they'll fall in love with it too. Then you can have a fun night putting it all together. 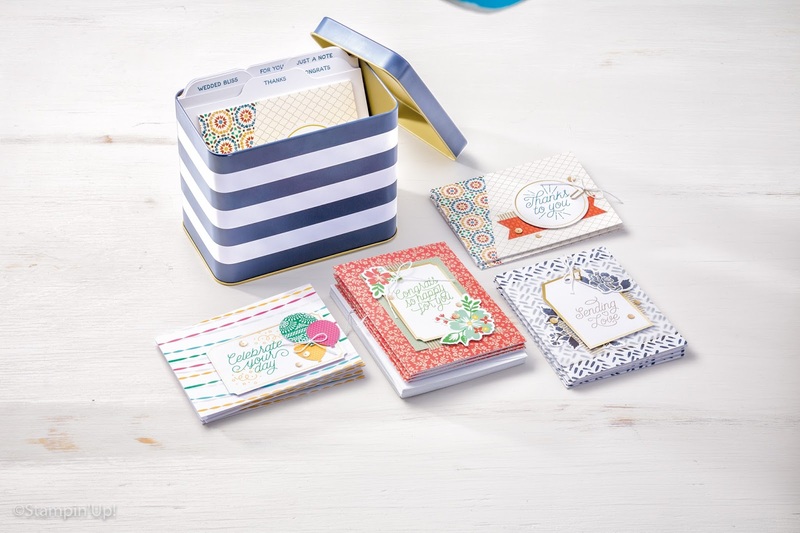 You'll find the Designer Tin of cards on page 160 of the Stampin' Up! catalogue. To view the catalogue online click here. Please ask me more about how you can earn free product this month.